We suggest you play the original, free, Flash version instead the full explanation isnt worth the outlay. There's a fine line between challenge and frustration. Behind it, I hope there's a firing squad with their guns aimed right at No Time To Explain's evil mole boss's grinning face. It's a platformer that should be great fun: chaotic and endlessly varied. None of it matters though, thanks to a descent into platform hell that's unfit to lick the gristle from Super Meat Boy's toenails. "Difficult moments either rev you up to take another shot or recover disk space." Here's the pitch. You're you. Look down. Close enough. You're hanging around at home one day, when a you from the future appears, shouts, “There's no time to explain!” and is immediately abducted by a giant alien crab. Snatching his beam cannon, you immediately follow in search of answers and, for no particular reason, hidden comedy hats. Hurrah! Except not. Platformers like this live and die on three things – their gimmick, their precision, and the satisfaction of the challenge. Without the first, who cares? Without the second, victory feels unearned and death unfair. Most important of all, the third defines whether difficult moments rev you up to take another shot, or recover some disk space. No Time To Explain fails them all. The beam cannon (not your only weapon, but the main one) is used for travel rather than killing, propelling you around the game's map. It's incredibly fiddly though, especially when combined with jumps or quick deaths like a springboard pointed at a spike trap. "It's a test of patience more than skill, made worse by floaty controls." As such, most of the tough jumps boil down to endlessly abusing the way you usually respawn on the last bit of solid ground you touched, and repeatedly throwing yourself at each problem until you skim through on dumb luck. It's a test of patience more than skill, made worse by floaty controls, unforgiving timed traps, and regular visits from an unwelcome glitch fairy. Then you meet that sodding mole. Bosses are always terrible in these games, and No Time's are worse than most, not least because it's tough to tell whether you're having any effect. Unlike previous bosses though, where you can't die, this horrible fight forces a restart for every screw up until you've generated enough raw hate to resurrect Vigo the Carpathian's whole extended family. It crashed three times, and glitched out several more times. I'd not enjoyed the game up to this point. With that, it burned its last bridge. 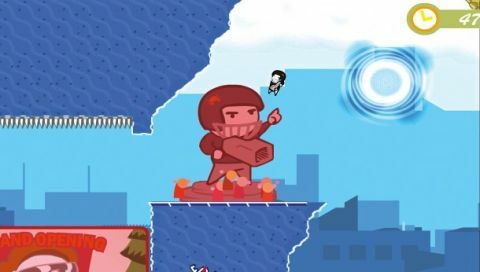 There have been some great platformers in recent years, from the harsh-but-fair brutality of Super Meat Boy to the gleefully sadistic I Want To Be The Guy. No Time To Explain isn't one of them. It's less trial than error – a game of cheap death and impotent rage. Never knowing what's coming next unquestionably adds spice, but not enough to compensate for the bland core game it has to be sprinkled over. There are too many better alternatives out there to find time for this one.